Naga Panchami habba or Festival is one of the auspicious day for Hindu women. India, the land of cobra, and snake charmers as it is famous for, has special reverence to the snakes. The serpents are associated with many Gods in the Hindu mythology. Naga (snake) Panchami is the 5th day of the Shravana month of the Hindu calendar. 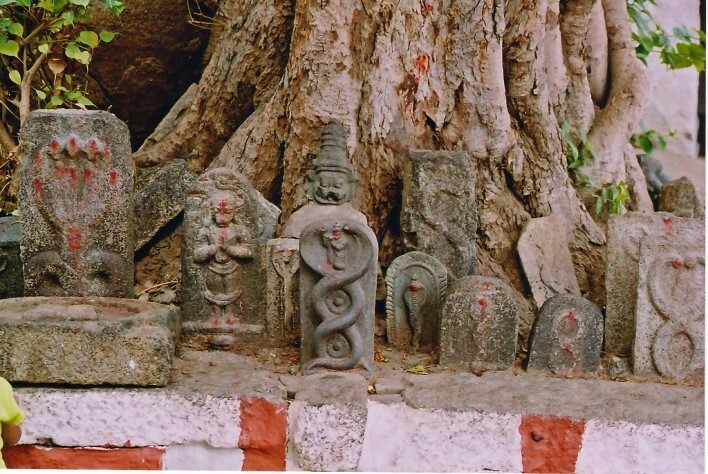 On this day sculpt images or idols of snakes are made and worshipped through the country. In South India figures of snakes are drawn with red sandalwood paste on wooden boards, clay images are made in yellow and black colour. Off late people buy Snake Gods made of silver, gold or Pancha Loha (combination of 5 metals prefer ed specially of worship). People visit the Naga temple or “Ant hill” is worshipped with reference that snakes lived in Ant hills. People decorate the ant hill with vermilon, turmeric, flowers and fruits. They prepare special sweets and savouries out of till seeds, pop corn from jawar etc. They offer milk and honey. Some also perform Puja to actual cobra, considering it as the sacred and the favourite of Lord Shiva. There is also special significance of this festival that the brothers invite sisters and offer them gifts and presents, enhancing the bonds between the families. This is similar to “Raksha Bandhan” which comes in the same season. Naga Panchami is held to honour the Serpent God. But due to the festive rituals, people tend to catch snakes in the wild and torture the poor creatures. They force them to drink milk, their fangs are forcible taken out to join the rituals of the day. Festival goes can celebrate and enjoy themselves without torturing snakes.